صباغی, صمد, دوراقی, فاطمه. (1396). تخریب فتوکاتالیستی متیلن بلو به کمک نانوکامپوزیت 2ZnO/SnO. نشریه شیمی و مهندسی شیمی ایران, 36(2), 141-149. صمد صباغی; فاطمه دوراقی. "تخریب فتوکاتالیستی متیلن بلو به کمک نانوکامپوزیت 2ZnO/SnO". نشریه شیمی و مهندسی شیمی ایران, 36, 2, 1396, 141-149. صباغی, صمد, دوراقی, فاطمه. (1396). 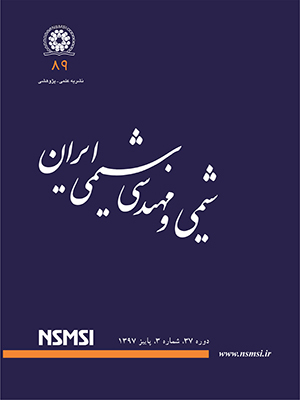 'تخریب فتوکاتالیستی متیلن بلو به کمک نانوکامپوزیت 2ZnO/SnO', نشریه شیمی و مهندسی شیمی ایران, 36(2), pp. 141-149. صباغی, صمد, دوراقی, فاطمه. تخریب فتوکاتالیستی متیلن بلو به کمک نانوکامپوزیت 2ZnO/SnO. نشریه شیمی و مهندسی شیمی ایران, 1396; 36(2): 141-149. Kuzhalosai V., Subash B., Senthilraja A., Dhatshanamurthi P., Shanthi M., Synthesis, Characterization and Photocatalytic Properties of SnO2–ZnO Composite under UV-A Light, Spectrochimica Acta Part A: Molecular and Biomolecular Spectroscopy, 115(1): 876-882 (2013). Hamrouni S., Hinda Lachheb, Ammar Houas, Synthesis, Characterization and Photocatalytic Activity of ZnO-SnO2 Nanocomposites, Materials Science and Engineering (2013). زمانخان، حسام؛ آیتی، بیتا؛ گنجی دوست، حسین؛ تجزیه فتوکاتالیستی فنل به وسیله نانوذرات روی اکسید تثبیت شده بر بستر بتنی، نشریه شیمی و مهندسی شیمی ایران، (3و4) 9:31 تا 19 (1391). Mai F.D., Chen C.C., Chen J.L., Liu S.C., Photodegradation of Methyl Green Using Visible Irradiation in ZnO Suspensions Determination of the Reaction Pathway and Identification of Intermediates by a High Performance Liquid Chromatography–Photodiode Array-Electrospray Ionization-Mass Spectrometry Method, Journal of Chromatography A, 1189: 355–365 (2008). Yang Z., Lv L, Dai y., Xv Z., Qian D, Synthesis of ZnO–SnO2 Composite Oxides by CTAB-Assisted Co-Precipitation and Photocatalytic Properties, Applied Surface Science, 256; 2898–2902 (2010). Houas A., Lachheb H., Ksibi M., Elaloui E., Guillard CH., Herrmann J.M., Photocatalytic Degradation Pathway of Methylene Blue in Water, Applied Catalysis B: Environmental, 31: 145–157(2001). Lin C.C., Chiang Y.J., Feasibility of Using a Rotating Packed Bed in Preparing Coupled ZnO/SnO2 Photocatalysts, Journal of Industrial and Engineering Chemistry, 18: 1233–1236 (2012). Li D., Haneda H., Ohashi N., Hishita Sh., Yoshikawa Y., Synthesis of Nanosized Nitrogen-Containing MOx–ZnO (M = W, V, Fe) Composite Powders by Spray Pyrolysis and Their Visible-Light-Driven Photocatalysis in Gas-Phase Acetaldehyde Decomposition, Catalysis Today, 93-95: 895–901 (2004). Li D., Haneda H., Photocatalysis of Sprayed Nitrogen-Containing Fe2O3–ZnO and WO3–ZnO Composite Powders in Gas-Phase Acetaldehyde Decomposition, Journal of Photochemistry and Photobiology A: Chemistry, 160: 203–212 (2003). Yang J., Li D., Wang X., Yang X.J., Lu L.D., Rapid Synthesis of Nanocrystalline TiO2/SnO2 Binary Oxides and Their Photoinduced Decomposition of Methyl Orange, Journal of Solid State Chemistry, 165, 193-198 (2002). Shi L., Li Ch., Gu H., Fang D., Morphology and Properties of Ultrafine SnO2-TiO2 Coupled Semiconductor Particles, Materials Chemistry and Physics, 62: 62-67 (2000). Wang L., Wei H., Fan Y., Gu X., Zhan J., One-Dimensional CdS/α-Fe2O3 and CdS/Fe3O4 Heterostructures: Epitaxial and Nonepitaxial Growth and Photocatalytic Activity, J. Phys. Chem. C, 113: 14119–14125 (2009). Wang C., Xu B.Q., Wang X., Zhao J., Preparation and Photocatalytic Activity of ZnO/TiO2/SnO2 Mixture, Journal of Solid State Chemistry, 178: 3500–3506 (2005). Cun W., Jincai Z., Xinming W., Bixian M., Guoying Sh., Ping’an P., Jiamo F., Preparation, Characterization and Photocatalytic Activity of Nano-Sized ZnO/SnO2 Coupled Photocatalysts, Applied Catalysis B: Environmental, 39: 269-279 (2002). Marco S. Lucas, Jose´ A. Peres, Degradation of Reactive Black 5 by Fenton/UV-C and Ferrioxalate/H2O2/Solar Light Processes, Dyes and Pigments,74: 622-629 (2007). Aksu z, Application of Biosorption for the Removal of Organic Pollutants: A Review, Process Biochemistry, 40: 997-1026 (2005). Somasiri W, Li X.F., Ruan W.Q, Chen Jian, Evaluation of the Efficacy of Upflow Anaerobic Sludge Blanket Reactor in Removal of Colour and Reduction of COD in Real Textile Wastewater, Bioresource Technology, 99: 3692–3699 (2008). Wang C., Wang X., Xu B.Q., Zhao J., Mai B., Peng P., Sheng G., Fu J., Enhanced Photocatalytic Performance of Nanosized Coupled ZnO/SnO2 Photocatalysts for Methyl Orange Degradation, Journal of Photochemistry and Photobiology A: Chemistry, 168: 47–52 (2004). Kumar H., Rani R., Structural and Optical Characterization of ZnO Nanoparticles Synthesized by Microemulsion Route, International Letters of Chemistry, Physics and Astronomy, 14: 26-36 (2013). Zhang B., Tian Y., Zhang J., Cai W., The FTIR Studies on the Structural and Electrical Properties of SnO2:F Films as a Function of Hydrofluoric Acid Concentration, Optoelectronics and Advanced Materials – Rapid Communications, 4(8): 1158-1162 (2010). By Özlem Esen Kartal, Murat Erol, and Hüseyin OgÏuz, Photocatalytic Destruction of Phenol by TiO2 Powders, Chem. Eng. Technol., 24, 6 (2001). Konstantinou I.K., Albanis T.A., TiO2-Assisted Photocatalytic Degradation of Zzo Dyes I Aqueous Solution, Kinetic and Mechanistic Investigations, A Review. Appl. Catal. B, Environ., 49: 1-4 (2004). Mahmoodi N.M., Rayat Tari K.H., Borhany S., Arami M., Nourmohammadian F., Decolorization of Colored Wastewater Containing Azo Acid Dye Using Photo-Fenton Process, Operational Parameters and a Comparative Study, J. Color Science and Technology, 2: 31-40 (2008). Mahmoodi N.M., Arami M., Gharanjig K., Nourmohammadian F., Decolorization and Mineralization of Basic Dye using Nanophotocatalysis, Pilot Scale Study, J. Color Science and Technology, 1: 1-6 (2008). Daneshvar N., Khataee A., Rasoulifard M.H., Seyed Dorraji M., Removal of Organic Dyes from Industrial Wastewaters Using UV/H2O2, UV/H2O2/Fe (II), UV/H2O2/Fe (III) Processes, J. Water and Wastewater, 61: 34-42 (2007). Ghanbarian R., Mahvi A.H., Nabizadeh R., Saeedniya S., A Pilot Study of RO16 Discoloration and Mineralization in Textile Effluents Using the Nanophotocatalytic Process, J. of Water and Wastewater, 69: 45-51 (2008).